With the season now less than a week away, and the Leafs basically at the cap ceiling (and without Franson) I thought it’d be a good time to explore some of the options that Nonis has, or to simply attempt to make things easier for all you readers out there who are confused by the dollars and cents of it all. Hopefully by the end of it, you’ll have a clearer idea of the tools at the disposal of Maple Leafs upper management. Less than $1 Million in Cap Space You Say? Well, yes, the Maple Leafs currently have only $995,833 of free cap space at the moment, according to capgeek.com. That is with the current “main” roster of 14 forwards, 7 ‘D’ and two goaltenders. I say “main roster” because obviously in the coming week this roster may be tweaked. Multiple players are still at training camp and some of them have a legitimate shot at making the team. Among those not on the main roster with a shot are defensemen Morgan Rielly and T.J. Brennan, as well as forwards Carter Ashton, David Broll and others. The current roster is at 31 players. If any of these players are to make the team, then players on the main roster will have to be sent down. The problem however is that all of them (except for Jake Gardiner, who let’s face it, won’t be sent down) are on one-way contracts. What this means is that if Nonis decides to demote them, any other NHL team will have an opportunity to claim them. So there is always a gamble. 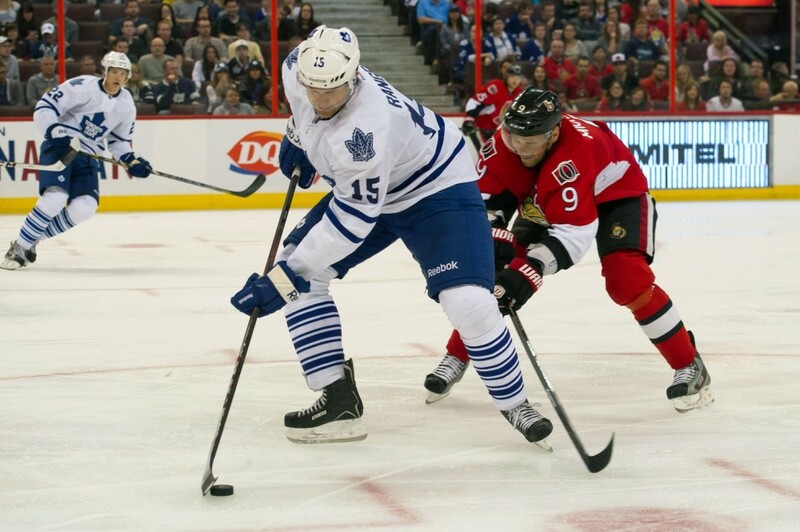 If Colborne for example is demoted, will someone claim the 6-foot-5 center? It’s quite possible someone would and then we lose him for nothing. 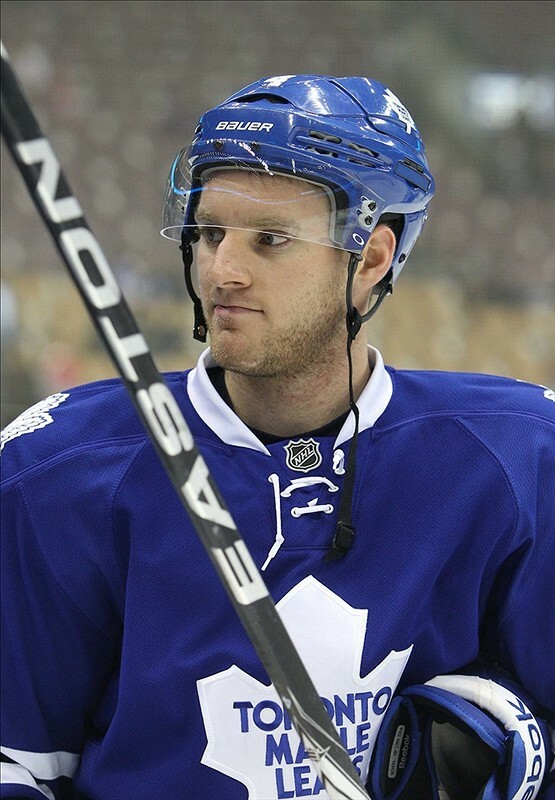 The Franson Holdout: What Can Be Done? Of course all of this is more difficult because of Cody Franson’s holdout. He will not sign for less than $1 million and if he would then this would hardly even be an issue at all. But Franson wants somewhere between $3 and $4 million on a one-year deal (the Leafs want a two-year deal). Nonis isn’t budging because he doesn’t have to; they will be under the cap and roster compatible to start the season without Franson (who, by the way, elected NOT to go to arbitration, which right now isn’t looking so good). So Nonis feels comfortable without Franson. But just in case some of you don’t (and I certainly don’t), I’ve decided to compile a chart that outlines the options the Leafs GM has IF he wants to create more cap sapce. Obviously, as mentioned earlier, he could do nothing and not worry about trying to squeeze Franson in. As the season wears on though, that could become problematic. As the chart shows, every player would have to clear waivers if sent down, because they are all on one-way contracts. The more important thing the chart shows is how much cap space each demotion would create. Liles and Ranger would each create almost $1 million in space but they are both the toughest demotions. Ranger is playing very well and appears he will start the season in the top-4. Liles makes so much money it would just be a pity to have to send him down and still pay him almost $3 million. The funny thing however is Liles being paid so much (and for 3 more seasons) is likely the very same reason that no other team will claim him. Colborne I do not believe will get sent down because 6-foot-5 centers who are 23 and still have upside don’t come along very often. And he’s cheap. To me, this makes Smith and Holzer fairly obvious demotions, which would together clear up an additional $1,337,500. Then Toronto would have a total of just over $2.3 Million in cap space. If Clarkson & Kessel suspended & Orr, McLaren & Bolland injured, #Leafs will be left with this opening day: 9F, 7D, 2G & $995k in cap space. With the Clarkson suspension it looks concerning doesn’t it? But in reality, it isn’t as bad as it seems. First, Kessel was not suspended for any regular season time (that tweet came before his hearing). Second, Randy Carlyle was asked if Bolland would be ready for October 1st and his response was “for sure.” Without demoting Smith and Holzer as mentioned above, that gets the roster to 20 (11 F, 7 D, 2 G). Hopefully, McLaren and Orr are ready for opening night. If not, a youngster will fill the void for the time being, which would pretty much guarantee no Franson for the early part of the season. With all the cap mayhem, I decided I’d have a little fun and guess what might happen. 6) Before Rielly plays his 10th game, he gets sent down to the WHL to free up more room and because there are already six defenseman now with Franson. This will happen at the nine game mark or before because it prevents Toronto from burning a year of Rielly’s contract. Remeber, Rielly is still too young for the AHL (If Rielly is playing SO well that this seems absurd, then I guess it won’t happen.) Cap Space now back to around $2 Million. This is enough to be somewhat flexible at the trade deadline. I hope part of this cleared up the Toronto Maple Leafs options in terms of what they can or can’t do before the season starts and how they might be able to sign Franson. If you’re still confused then post a comment, or send me a tweet because that would mean I haven’t done my job correctly!